The Disney Channel’s “Andi Mack” will unveil an LGBTQ storyline in its second season premiere, airing tomorrow. 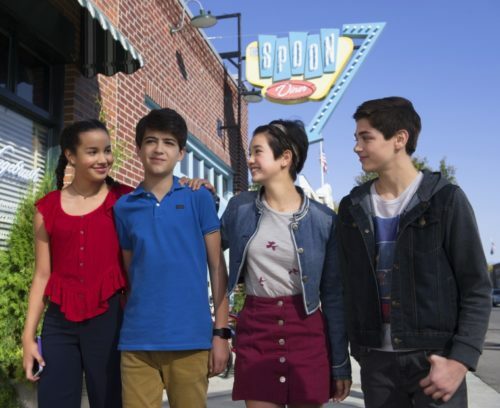 The show centers around a young teenage girl, the titular “Andi,” played by Peyton Elizabeth Lee, who learns that who she thought was her older sister is actually her mother. She is working to navigate the world and her place in it, with the support of best friends Cyrus (Joshua Rush) and Buffy (Sofia Wylie). So it seems the perfect vehicle to place a story about a character making their own journey of self-discovery as a member of the LGBTQ community. In the episode, Cyrus confides in Buffy. The scene, and what Buffy says to Cyrus, makes for positive role models both for kids and adult viewers. In subsequent episodes, Cyrus begins to understand himself, and can count on his supportive friends Buffy and Andi who, as teenagers, are also on a journey to self-discovery. He also grapples with how to tell his new girlfriend, Iris, about his new understanding of himself. Both GLAAD and the network say the show will have a positive impact.